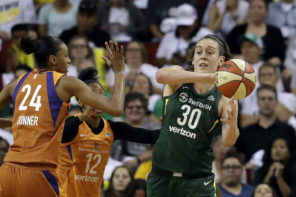 Unlike Game 1, Game 2 of this year’s WNBA Finals between the Seattle Storm and Washington Mystics looked more like a WNBA Finals game. The games may have been different but the result was similar with the Storm prevailing by a final of 75-73, putting Seattle one win shy of their third WNBA championship. This one came down to the wire. With the Storm leading 74-73, Breanna Stewart, a proficient free-throw shooter, was fouled. She uncharacteristically missed both of her tries from the charity stripe, giving the Mystics a golden opportunity to take the lead. The Storm’s defense keyed in on Kristi Toliver, given her proficiency at hitting both midrange jumpers and three-pointers, even though she did not make a single shot from behind the arc for the game. Sue Bird got a piece of the ball and Toliver lost it, leading to a jump ball which was won by Seattle. Washington finally fouled Alysha Clark with less than two seconds to play. She made one of two from the line, but the Mystics were not able to advance the ball as they had no timeouts remaining. Ariel Atkins last-second heave would miss its mark, and the Storm had claimed Game 2. Elena Delle Donne finished with 17 points. Atkins and Toliver each concluded their afternoons with 15 apiece. LaToya Sanders pulled in seven rebounds. Mike Thibault’s team did present a much-improved defensive effort as opposed to Game 1 – and it kept the contest close throughout. In fact, the Mystics had missed all 16 of their three-point attempts – which prompted quite the response from Toliver at the post-game press conference. Kristi Toliver when asked about going 0 of 16 from behind the arc, "Oh, sh**, I didn't know we were 0 of 16." Washington is three out of 37 from downtown for the series. Another element that received its response from Thibault – the officials. Mike Thibault: "I'm trying to figure out how Breanna Stewart shot 14 free throws and Elena Delle Donne shot 3." The Storm had a 25-16 lead after Game 1, but Washington made sure this one did not get out of hand the way Game 1 did. The Mystics outscored Seattle 24-11, in large part with Aerial Powers providing energy on both sides of the floor. Washington had a 40-36 lead at the half. 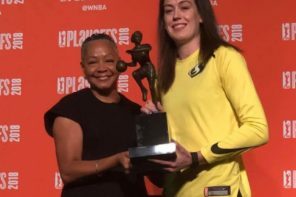 Breanna Stewart led the Storm with 25 points and Jewell Loyd added 13. Speaking of said number, 13 would also be how many rebounds were hauled in from Natasha Howard. 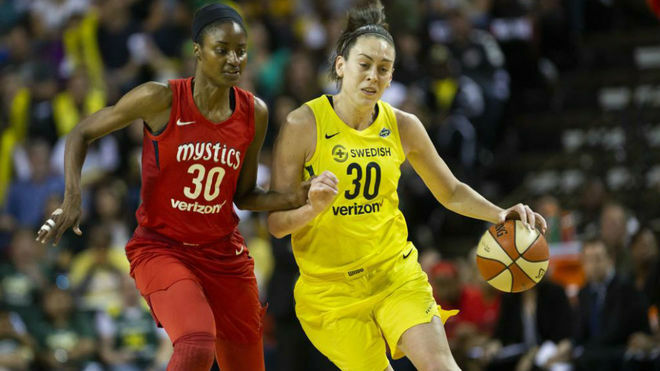 The scene will shift to Fairfax, Virginia’s George Mason University for Game 3 on Wednesday nights with the Mystics looking to stave off elimination…and the Storm in search of its third title.